Using great skin care products makes you feel great for sure. Spring is already here and our skin needs something extra to shine and get a healthy glow. The facial Vitamin C Moisturizer from Made from Earth, contains the highest possible concentration of Vitamin C, necessary to make our skin look young and smooth. This moisturizer can be described in one word: “rich”. It brings such an abundance of care – organic ingredients like coconut oil to effectively moisturize dry skin, evening prime rose oil to sooth dry and itchy skin and a combination of MSM and Vitamin C to boost collagen production and brighten the skin and much more. It is pretty thick to call it a moisturizer but I do not mind to use it on a daily basis. The Vitamin C Moisturizer was designed to boost collagen production, moisturize, fight fine lines and brighten your skin all in one. The Vitamin C Moisturizer makes your skin smooth and soft, I feel like I use the best and meticulously picked combination of ingredients, and not just a moisturizer that sits on your skin and then you wash it away. I like that this product works for all skin types and for my combination type skin it is the perfect find. I did not have any irritations while using this product. 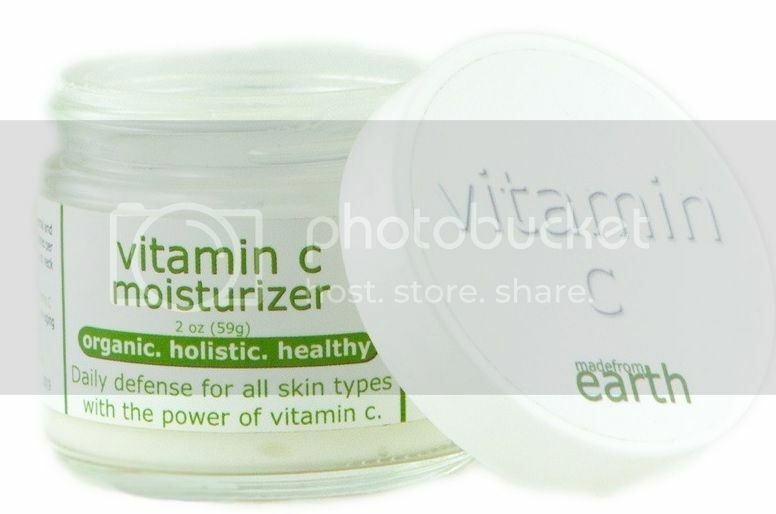 Thanks to Made from Earth, one our reader is going to win Vitamin C Moisturizer. The giveaway is open to US and Canadian residents only & ends May 5, 2015. I would like to try the grapefruit glycolic wash. I would also love to try their Chamomile Eye Therapy. I love the Vanilla lip balm. I would also like to try the ROOIBOS TEA FACIAL SCRUB. The facial scrub definitely looks nice! I'd like to try this one: SEA KELP & CLAY CORRECTING MASK.